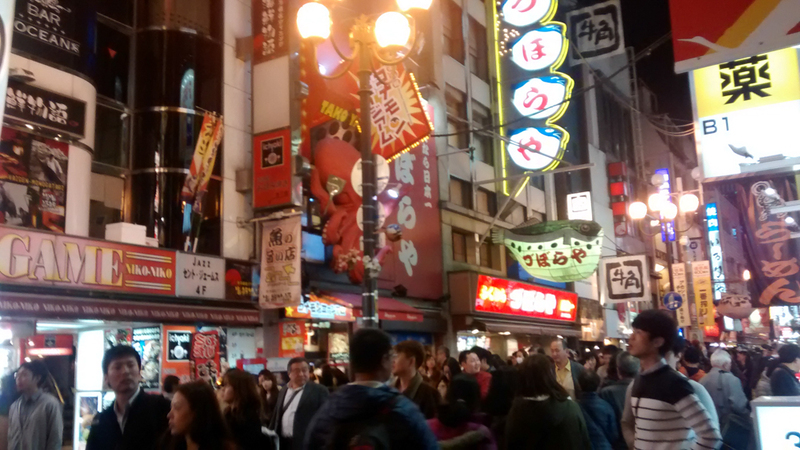 Visit Osaka’s Dotonbori area. Great food! Decent shopping! And crabs. 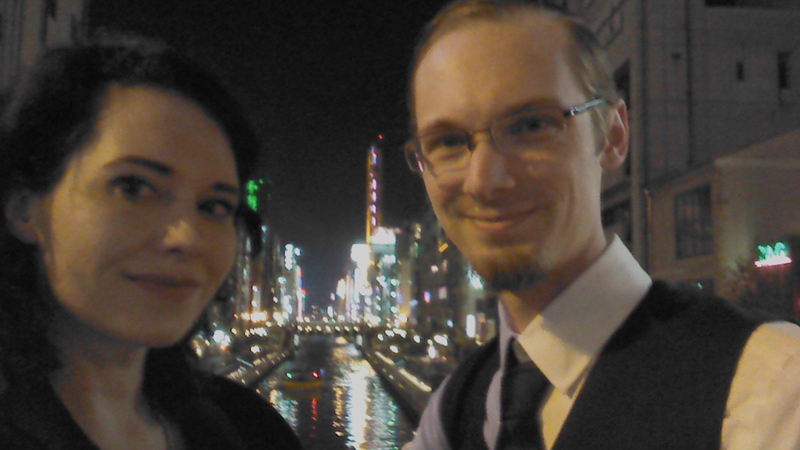 The last time we came to Osaka, we tried to find the Dotonbori area since it was listed as a place worth seeing. When we tried to get to it, we must have gotten off on the wrong side of the road since we ended up in a pretty seedy area full of love hotels. In retrospect I think we might have ended up somewhere closer to Shinsekai. There are worse fates than spending an evening looking for gourmet cuisine in the red light district but on our return visit we made it a point to find Dotonbori. This time, we still didn’t quite succeed at first. Exiting the train station, we oriented ourselves as we always do (pick a random direction and start walking until we find something amusing). 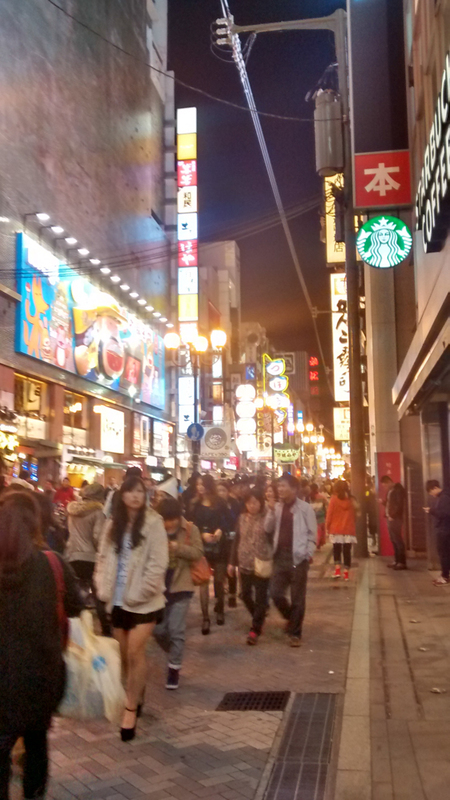 We ended up wandering the entirety of Den Den Town, Osaka’s version of Akihabara. After dark, it’s very underwhelming– all of the stores are of the smaller mom-and-pop bins-of-electronics-everywhere variety, and all of them were shuttered by the time we strolled through. It wasn’t even that late. Some time was spent looking for jewelry stores, of which we were unsuccessful. We were trying to find an opal necklace for our oldest daughter but it was proving to be a fruitless effort. We did find more than one store selling stone-based jewelry, but strangely enough “おぱる わ ありますか” wasn’t getting us anywhere. Perhaps my pronunciation was off. I had yet to start drinking, so this wasn’t surprising. Speaking Japanese gets easier with every beer. Deferring to the GPS, we walked a few blocks north, ended up back at the train station we started from and eventually stumbled into Dotonbori! How we managed to miss something this obvious, almost twice, was beyond us. It was a lot like Shibuya. Crowded, mostly 20s-and-under demographic. 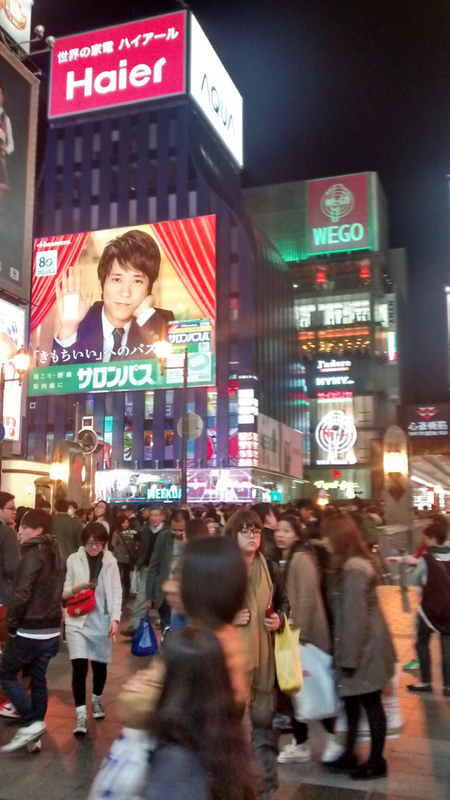 Lots of bright billboards and lights. Everybody was walking around with shopping bags so I imagine there has to something worth buying around here. 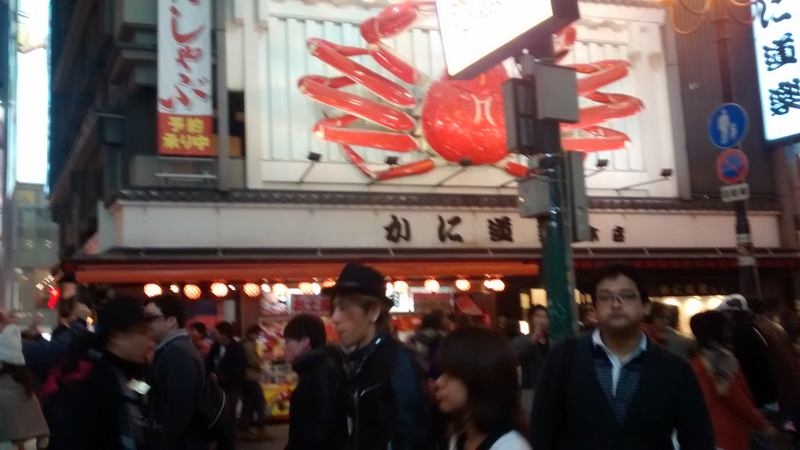 After having been to Dotonbori, it seems the association between crabs and Osaka is not a coincidence. At both ends of the street were restaurants using giant animatronic crabs to advertise their cuisine. Crab must be a common catch around here. 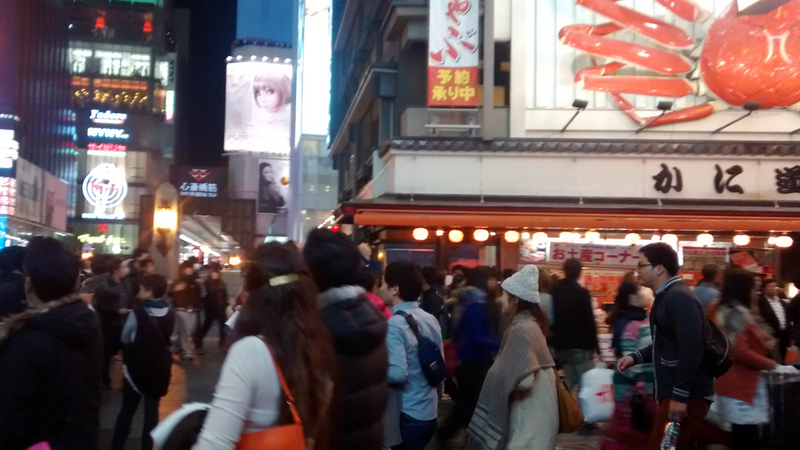 We tried to find a ramen shop but all the restaurants had no seating (full to capacity! ), and the one that seemed to have seating also happened to be out of ramen. All they were serving was takoyaki (grilled octopus balls). So we wandered off away from the hustle and bustle and found ourselves crossing a channel. It happened to be one of those iconic views of Dotonbori you see in popular media. There are a lot of these sorts of bridges down the river. On the other side of the channel, past some host clubs and sitting at the corner of a lonely intersection, we found a Nakau! To most, I’m sure it’s just a typical noodle shop but something about it appeals to us. The only other place we’d ever seen one was on an equally lonely corner at the end of Gion in Kyoto. 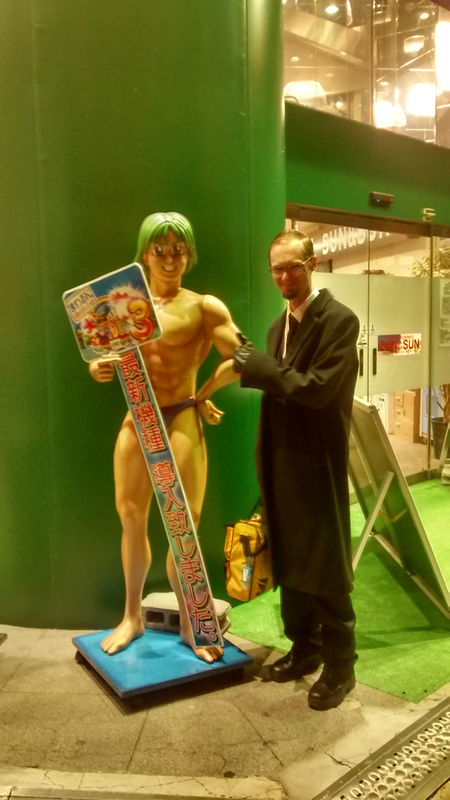 We also happened to find my beefcake avatar. This is what I look like in my own mind.